As the final post of our 3-part series on OERs, this week we’re spotlighting Professor Javiela Evangelista’s OER for Africana Folklore: Afr1130. As mentioned the last two weeks, the general description of OERs seems straightforward – open and freely accessible educational resources. However in practice OERs are more ambiguous. This series aims to highlight some key features of OERs by spotlighting a few OERs being built by City Tech Faculty. While the last two weeks have focused on clarity and organization (Part 1), and flexibility (Part 2), what Professor Evangelista’s site highlights is that multimedia materials are often an important part of OERs. In general, teaching and learning with multimedia has been shown to increase comprehension and retention (i.e. Aloraini, 2012). In Africana Folklore, Professor Evangelista pairs a video, or a few, with a set of readings each week. These are not only intended to supplement, but are an important part of the course material. They fill in gaps in understanding and bring new information to the fore, while also reinforcing other material assigned that week. The consistent use of videos in her course is more pronounced in the context of the class field trip to Democracy Now!, and its related assignment. Democracy Now! is an independent media outlet that highlights social justice stories and news that are too often overlooked or misreported by mainstream media outlets. In the related assignment, Professor Evangelista asks students to compare independent and mainstream media outlets and to think about how and why they represent similar issues differently, and to what end. This field trip and assignment draw a contemporary parallel to the ways in which Africana Folklore “highlights the survival of African descendant people (and their stories) by way of oral, material and customary traditions”. To what extent are independent media outlets deploying similar strategies toward similar goals? Moreover, the field trip and assignment conveys lessons of media literacy without saying as much. This seems like an important opportunity for critical reflection on the use of videos as course material, as well as how students may use videos to supplement their independent learning at home. This drives home an important lesson inherent in multimedia pedagogy – for use in your OERs or otherwise – and of this time period in history: that it’s not just about the incorporation of multimedia text into our teaching and learning, but also the critical and responsible approach with which we do so. For more on multimedia pedagogy from the OpenLab, check out our Spring 2017 Event on the topic (includes external readings), and read the recap, which includes additional examples of multimedia pedagogy on the OpenLab and around CUNY. This concludes our 3-part series of OERs. Did you miss our first two weeks? Learn more about how organization and clarity (Part 1), and flexibility (Part 2) factor in when building an OER. Part 1 also includes and overview of OERs in general and at City Tech. To browse more OERs on the OpenLab, or learn more to create your own, check out City Tech’s OER Fellowship project site. This site includes external readings, information about the fellowship, and a link to each OER made through this fellowship. This week we’re spotlighting The Gowanus Project. This project explores the neighborhood and the history of its namesake, the Gowanus Canal, from four angles: arts and community, community and displacement, green infrastructure, and public space. 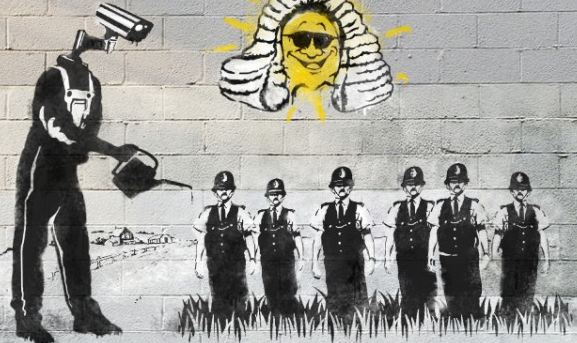 Each section has curated images, an outline, an annotated bibliography and a podcast. Together, the visitor is taken on a multisensory adventure of the neighborhood that explores the past and present of the neighborhood, and the main contentions forming its future. This project is the culmination of a semester-long inquiry into the Gowanus Canal led by Professors Nora Almeida and Amira Joelson for their LIB/Arch 2205 course. Over the course of the semester, students became ‘experts’ on the canal and its history through readings, podcasts, documentaries, and site visits. They digested their growing knowledge of the canal through written site reports summarizing their visits, and snapping photos and sketching out specific features of the surrounding built environment. On a technical level, this project is an excellent example of how to transform coursework into a publically interesting and useful project. For those of us who use the OpenLab, at the end of the semester our course sites are often full of interesting insights from our students. However, the content remains organized for a classroom audience. In some cases, this works – allowing another outside visitor to review and maybe even take your course. Nora and Amira’s approach to using the OpenLab for this course offers an alternative. By reorganizing the content on your site, or creating a separate project site as Nora and Amira did in this case, you can configure students’ insights in a way that is more legible to an external audience. This project also makes an important pedagogical pivot worth noting; using the OpenLab, it reworks traditional ‘learning’ relationships and re-situates students in the domain of public knowledge. In our classrooms, students are often situated as ‘the learners’ – those who take in information. This project, however, uses the OpenLab to also situate students as the knowers, and as the producers, curators, and sharers of knowledge. In many ways, this re-situating represents an important potentiality of open digital pedagogy and what can be achieved on the OpenLab, and we encourage you to consider if this is a value you can achieve in your courses as well. This week we’re spotlighting Professor Boisvert’s Game Design & Interactive Media course (MTEC 2210) in the Emerging Media Technology department. The course offers students a “cross-disciplinary foundation for the design of games and interactive multi-media technology” and may be of interest to artists, engineers, scientists, technologists and more! In terms of digging in, assignments and experiences lead students through the process of deconstructing and reconstructing various websites – thinking through the aims of an organization and the intended audience and design of the website. Students share their reflections on the blog, seemingly as a way of sharing their analysis with the class at large, as well as practicing public writing and reflection. 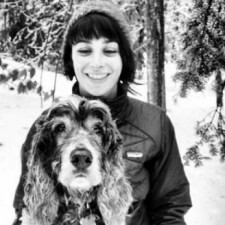 Professor Boisvert also uses the blog to post weekly reading questions. As the stated question below suggests, these questions ask students to think creatively and collectively about the readings. Judging by the responses, students not only engage one another in discussion about the readings, but given that many students seem to filter their responses through their own experiences, also build rapport and familiarity with other students. In this way, the reading response questions also function to grow community in the classroom and among students, enriching their participation in the class and their education at City Tech more broadly. These assignments and class activities ultimately prepares students to begin thinking through the design of a game. This also takes place on the blog, which is now – in theory – a familiar and friendly place to share and get feedback from peers and Professor Boisvert. As the end of the semester nears, check back to see how student-generated games like Space Pirates or League of Rappers evolve! This week we’re shining the spotlight on Story-telling in Interactive Fiction, a first year learning community (FYLC) organized by Professor Jackie Blain who teaches English, and Professor Candido Cabo and Professor Ashwin Satyanarayana who teach Computer Science courses. The three courses in this community will support students in creating an interactive fiction game over the course of the semester. Storytelling is one critical and tricky aspect of an interactive fiction game, and is the main focus in the English class of this FYLC. In interactive fiction games, storytelling is more complex than in a novel because the ‘interactive’ component of ‘interactive fiction’ means those ‘reading’ the story get to participate and make certain decisions about how the characters’ stories unfold. Thus the storyteller – here, the students – needs to create multiple scenarios and options that allow readers to forge their own path. This process can seem intimidating, particularly if one is an inexperienced storyteller. Seeming to anticipate this, Professor Blain has scaffolded the writing assignments so that students begin developing their storytelling skills by telling the stories they know best – those about themselves! Storytelling is not the only challenging aspect of this FYLC. Students will also need to develop the technical skills that will be needed to actually create the game. In the computer science courses students will discuss programming and games, Game Design Documents and learn how to use Python, a programming language, to create a video game based on the story developed in their English course. We encourage you to check some of the stories students are now sharing through various assignments, such as the About College project where students will reflect on their first weeks at CityTech, and to check back at the end of the semester to see what kinds of games students have come up with, and if possible, play a few of them! 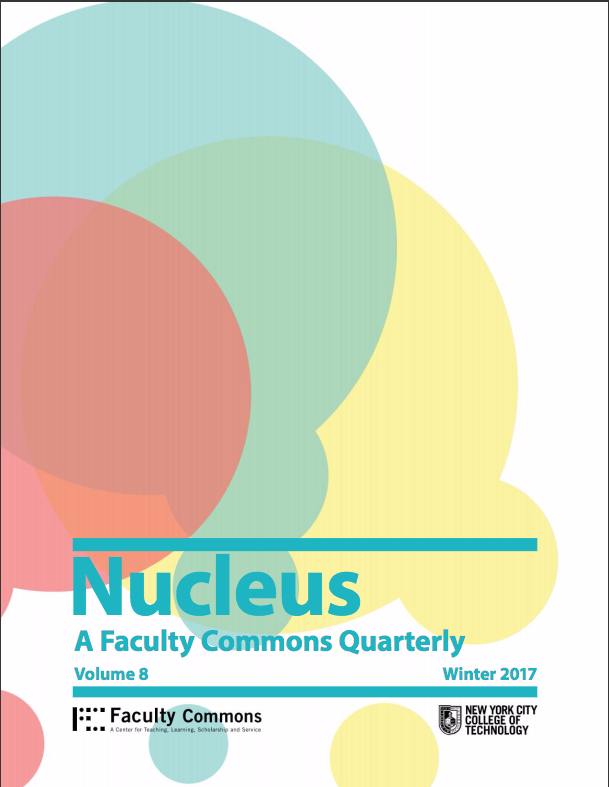 This week we’re spotlighting the recent issue of the Nucleus (Winter, 2017), our Faculty Commons Quarterly. 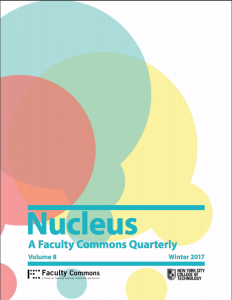 This season’s issue features pieces from faculty about the creative ways they’ve used the OpenLab in the context of their courses and/or research. Specifically, faculty discuss engaging students through creative and interactive assignments that incorporate multiple forms of media and dialogue, how the open and archival aspects of the OpenLab enable past students to share tips and strategies with newer students despite never meeting in person, how course sites can act as nodes in larger networks of resources that may benefit students academically, professionally, or otherwise, how to carry out collaborative student-faculty research projects, and how other innovative learning resources such as OERs and WeBWorks enrich students learning AND can help keep educational costs down for students. We hope you enjoy! A hearty thank you to the Faculty Commons for their enthusiasm and support with this issue and always. 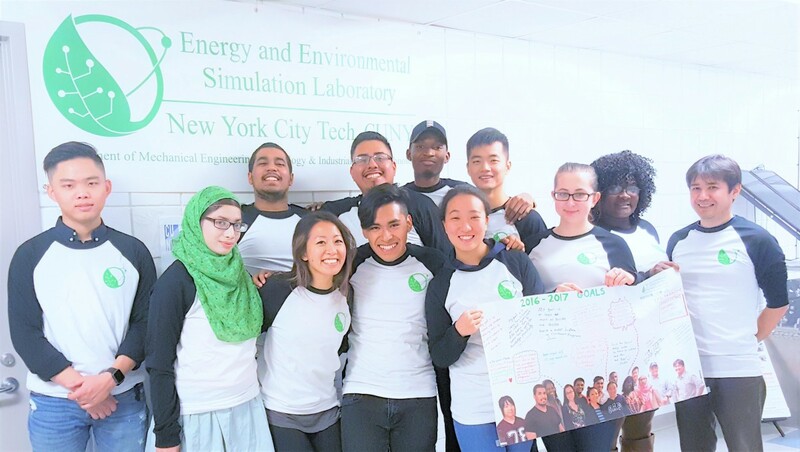 This week we’re spotlighting City Tech’s Energy and Environmental Simulation Laboratory (EESL). EESL is a research group organized by Professor Masato R. Nakamura in the Mechanical Engineering Department at City Tech. Though a research group, this group is open to anyone interested in conducting research on energy, environmental engineering and computing for sustainability. We’re spotlighting EESL’s site this week because of their clear presentation of content. EESL’s site is very easy to follow. Their site cleanly houses information on the group’s goals, work, activities and membership. Each page is organized around images, information, and links that can connect readers to more information. In addition to being easy to follow on its own, the consistency in style across pages helps the reader navigate the site more efficiently, feeling familiar on each page before taking in the content. The significance of this style of site presentation is that it is easily translatable in professional environments. In this way it offers Professor Nakamura and his colleagues a place to send other scholars and researchers if they are interested in learning more about their work. Additionally, it provides students with documentation archived chronologically overtime that speaks to – and shows – the work they’ve completed for the group. In sum, EESL is an example of site that has a strong public, professional face that can be interfaced with by an array of others – who might find the work interesting, might consider joining the group, might be assessing one of the member’s skills in relation to another position. In this way, it is an example that speaks to the reach of what OpenLab can offer its users, beyond their experiences here at City Tech. This week we’re spotlighting CityTech’s own “Roboquín”. In addition to being a seemingly futuristic mannequin robot fashion model that can interact with people via Bluetooth and Wifi connectivity, Roboquín is also a larger multidisciplinary project composed around the construction and showcasing of the mannequin robot (hereafter the robot will be referred to as RoboQueen and the project will be referred to as Roboquín). Though supervised by Professor Farrukh Zia of the Computer Engineering Technology department, this project is comprised of professors and students from a range of departments including Architecture, Mechanical Engineering, and Computer Science Technology. In this way, Roboquín is an excellent example of how OpenLab can facilitate cross-disciplinary communication and workflow. In addition to a description of the project and its members, the group uses their site for two purposes. First, they use the site to showcase ‘the travels’ of RoboQueen – from the 2016 World Marker Faire in Queens to CityTech’s own Annual Open House – and the visitors it has dazzled. 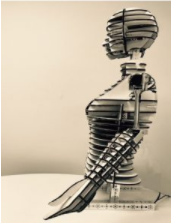 Second, Roboquín’s project site hosts images and information detailing the construction of RoboQueen, and includes links to resources that could be used by another team in the construction of their own ‘RoboQueen’. Beyond the potential for visitors of Roboquín’s site to replicate the designs, this information is emblematic of the kind of transparency OpenLab affords its users. Together, these two qualities allude to another important affordance embedded in OpenLab’s infrastructure – the ability to archive information in a centralized, organized and chronological way. Beyond sharing information, archiving is a critical process in project development as it allows one to see where a project has been and envision where it might go in the future. 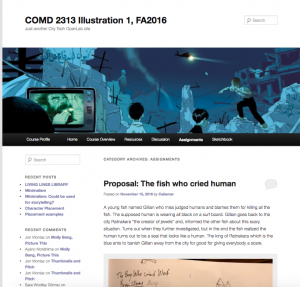 This week we’re highlighting Professor Sara Woolley Gómez’s course, COMD 2313: Illustration 1. Similar to other course sites, Professor Woolley Gómez has basic course information on it (syllabus and course policies). However, based on the other features on her course site, Woolley Gómez seems more inclined to use the site as a place for introducing additional features of the course and sharing student work. “Sketchbook” is such a feature that falls at the intersection of these two ambitions. Sketchbook is a place where students can upload photo essays documenting their process of creation with a particular assignment, activity or concept. In some cases these are supplemented with text-based descriptions that provide further insight into the process. In this way, Sketchbook is a good example of a digital assignment that structures space for meta-cognitive learning practices and growth. Moreover, these are shared publicly with the class and beyond, creating a space for students to think critically about public presentation and audience, and to engage peers in a discussion about learning practices and process. In addition, Woolley Gómez populates student assignment submissions under corresponding labels, creating an opportunity for students to review or engage with other student’s assignments. 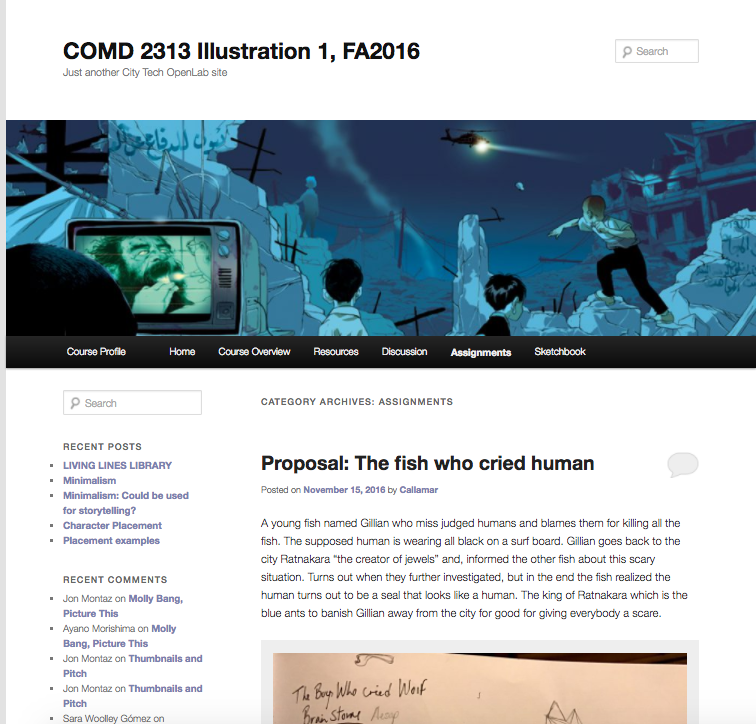 Lastly, there is a more general discussion page for sharing articles, illustrations and other art that may be of interest to peers. Visit Professor Sara Woolley Gómez’s course page for more! In Prof. Michael Krondl’s section of HMGT 1102 – Introduction to Hospitality Management, students can easily find the course syllabus, assignments, and readings. But most exciting about the site is the space it offers for students to blog about their visits to Smorgasburg and the Chelsea Market, complete with descriptions of the venues and mouth-watering photographs of the food. 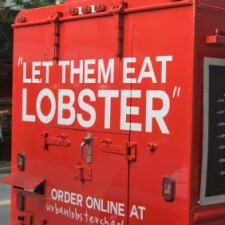 As a final project, teams of students will further use the OpenLab site to complete a concept of a New York City food truck, including a menu, standardized recipes, and spec sheets for the central ingredient of each menu item. Check out this site for a great example of student reflection, photography, and teamwork on the OpenLab — but not if you’re already hungry. In Prof. Lestón’s English class, Introduction to Language and Technology, students not only write responses to course reading, but also develop revision plans and second drafts of their writing on the course site. All this work — including Prof. Lestón’s feedback to each student — is available for the class to see, so that students benefit from observing their peers’ drafting process as well as their own. What’s more, Prof. Lestón has included the project that students in his Fall 2015 course undertook, thereby drawing a link from one semester to the next. And as an added perk, the “Culture Jams” section of the site keeps a “storehouse of viral images” related to the themes of the course, which both he and his students can populate as they come across them throughout the semester. Check out the site to see for yourself!